The Wooing Tree is a local landmark situated in the aptly named Wooing Tree Vineyard. The tree has an interesting history which the following lines from a poem written about the tree allude to. 'How many wives led single lives, romance was not a starter, until they fell beneath the spell of Pinus radiata'. When the land around the tree was being developed into a vineyard, local fondness for the tree ensured that it was retained to become a significant feature of it (Cadwallader, 2013). 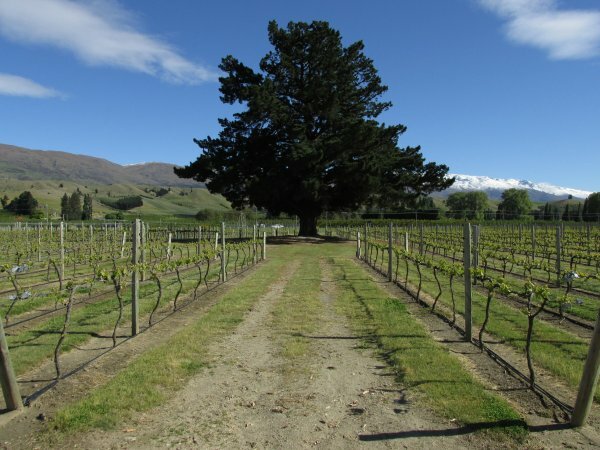 Endangered wooing tree to live on in vineyard Lovers leaf . . . Cromwell orchardist John Webb grins after saving the legendary Cromwell wooing tree from being felled. By Dave Smith Cromwell orchardist John Webb was aghast when he heard the Cromwell wooing tree was to get the chop. The tall pine tree has stood for an estimated 80 years on a block of land opposite his State Highway 6 orchard. According to Cromwell legend, it has been the birthplace of many innovative ideas, maybe a few conceptions on the soft bed of pine needles and more than the occasional tipple. 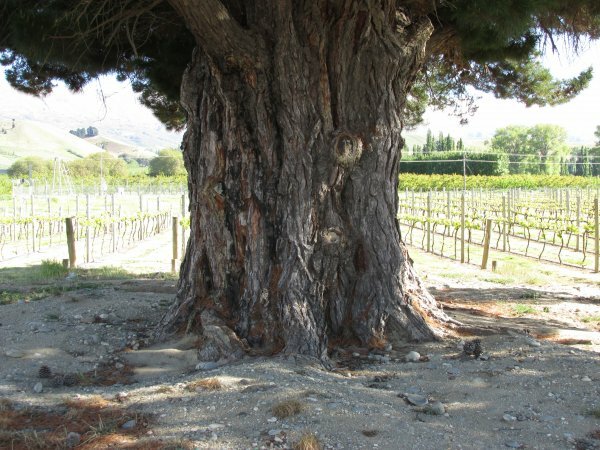 The tree, along with smaller trees on the 24ha block on the corner of State Highway 8b and 6, was due for the chop to make way for a vineyard development under the management of Bannockburn viticulturist Robin Dicey. "Saving the tree started over dinner with Robin and after a bit of friendly banter he relented. "I told him my father would turn in his grave if he knew the tree was coming down," Mr Webb said. Mr Webb (55) could recall his father, Jack Webb, talking about the tree. "He would look out the window and say `There is someone under the wooing tree this morning'." Mr Webb and wife Ainsley were a bit coy about having their photograph taken by the tree on Saturday, with Mrs Webb saying it would imply things. When contacted yesterday Mr Dicey laughed and confirmed the England-based New Zealand owners had ordered a stay of execution for the tree. "I told them it would be quite sad for the tree to go and a reprieve could be to their advantage," Mr Dicey said. "They have decided to name their vineyard, Wooing Tree Vineyard, after the tree." Oh, if only the tree could talk, what a tale it could tell. Otago Daily Times 8/4/2002. 29 Oct 2013 Cadwallader, B.G. At the far western end of the vineyard - difficult to miss.